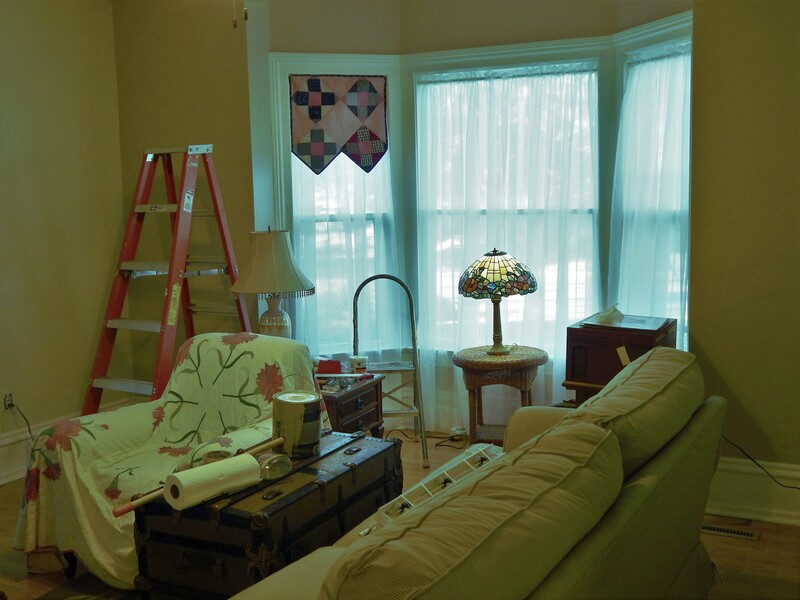 Remember the window valance project? It started because I really hated the blinds in the new space. I was not a big fan of that really dark paint either! A really dark gray-green. 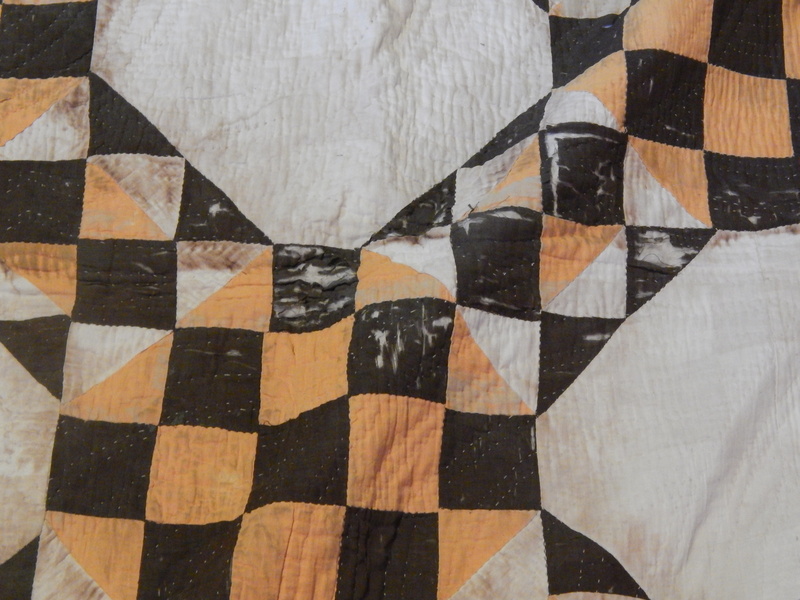 I hung a black and white quilt that sort of made the paint look intentional. 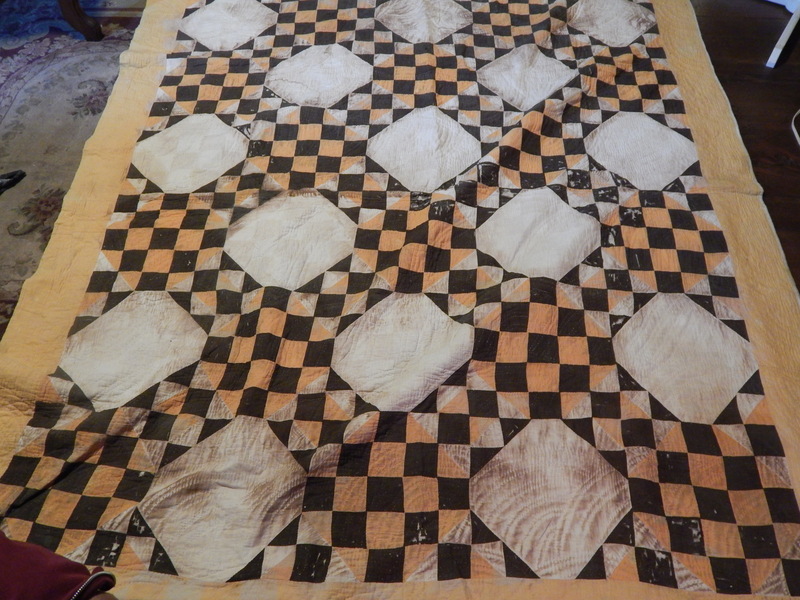 But it was not working for me (Next time I will post about how I hang quilts) I still hated the paint color. I had the start of the new valances for the windows and decided I should really try it on the window to see if I liked it enough to make the others. Once the blinds were down and the one valance in place I realized that as long as things were moved I might as well paint ……while painting I saw a damp spot on the ceiling. 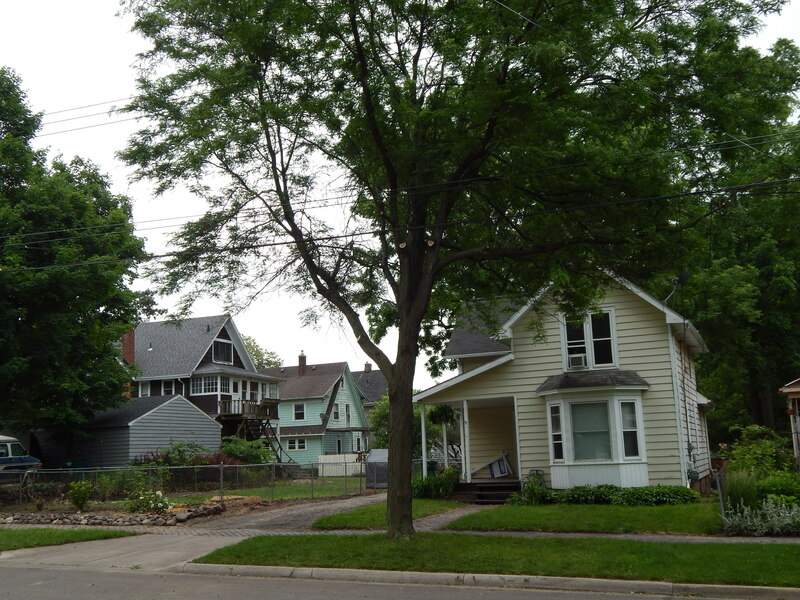 The house was re-roofed a few years ago but they failed to do the little section over the bay window and it had a leak. So I got the ladder and fixed that…..then got back to the task at hand and painted over that dark gray paint. Once that was done I figured what the heck I’ll paint the rest of the room. 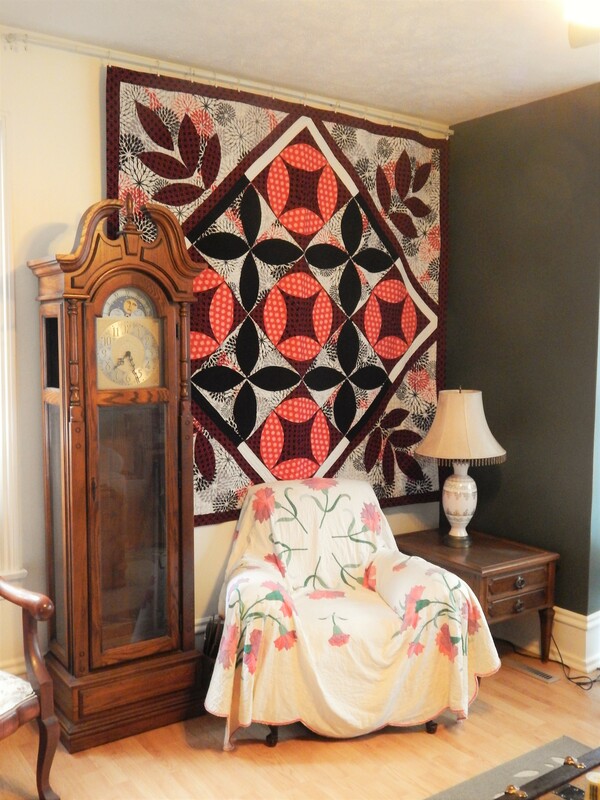 So lots of stuff moved out of the room, including the quilts I had just hung. And I got to work painting more. It is hard to tell in the pictures but the window wall is a tanish color and the other walls are celery. Once I get the room put back together I will post a picture……..but I found myself thinking that the last person who painted the woodwork didn’t do the best job so I might need to re-do that while I am at it. So now that the roof is fixed and the room is mostly re-painted I can get back to making the rest of the window treatments. I have a new to me treasure. 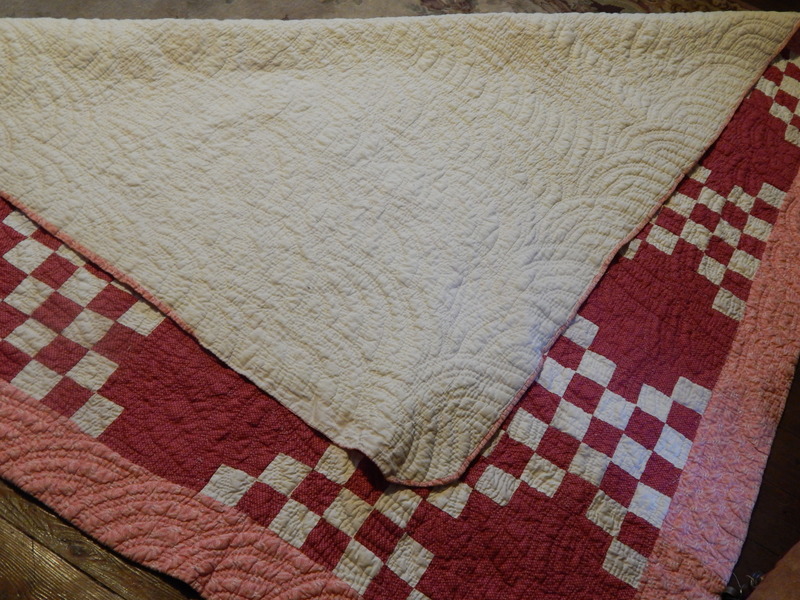 I was given this beautiful antique quilt at a guild meeting on Thursday (notice how the maker ran out of the red fabric and used the pink for that upper corner). 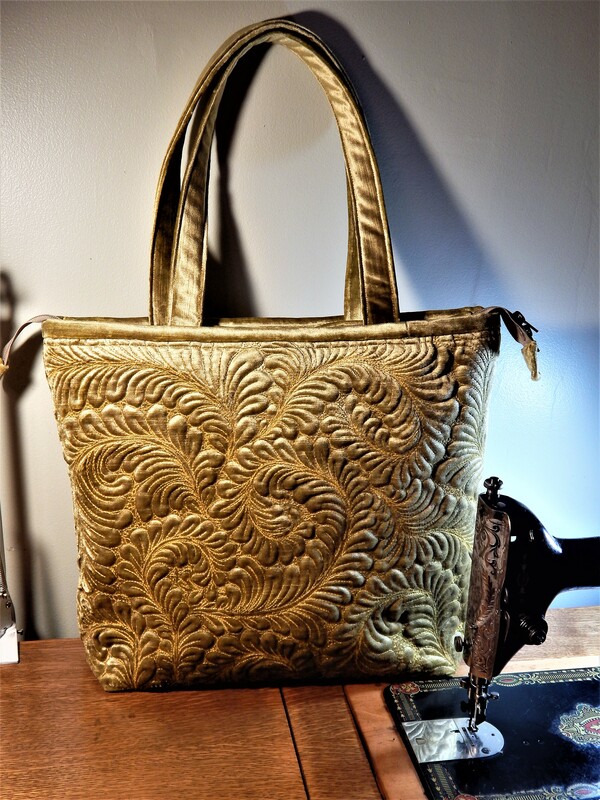 It had been stored for ages but in great shape….no wear at all…so I decided to wash it…..and it turned out beautiful (the difference in color is due to lighting). 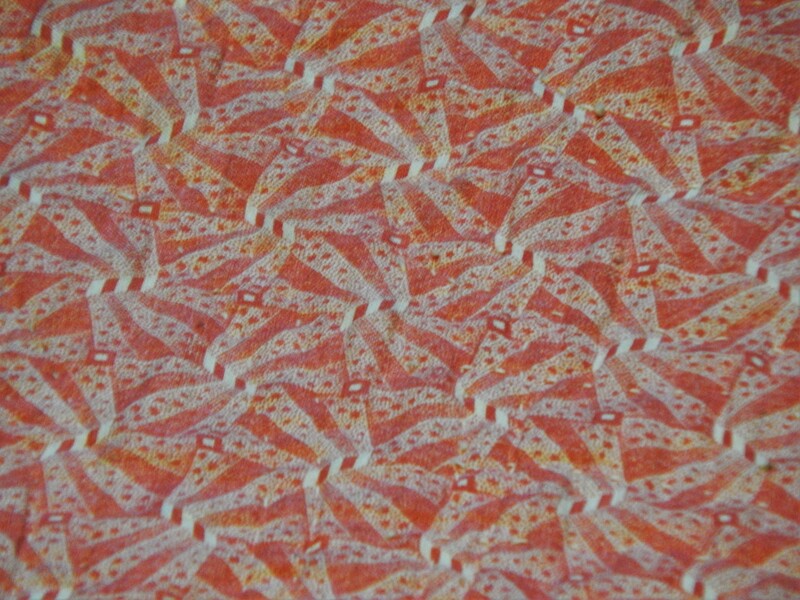 The border fabric is really beautiful . 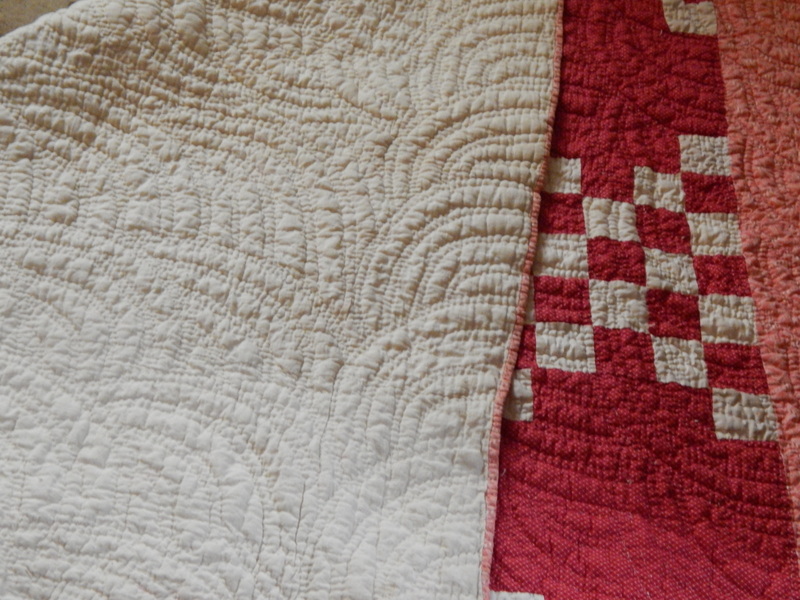 I don’t recommend washing antique quilts unless you know they can take it. That includes colorfast fabrics, not a lot of fraying shattering fabrics. 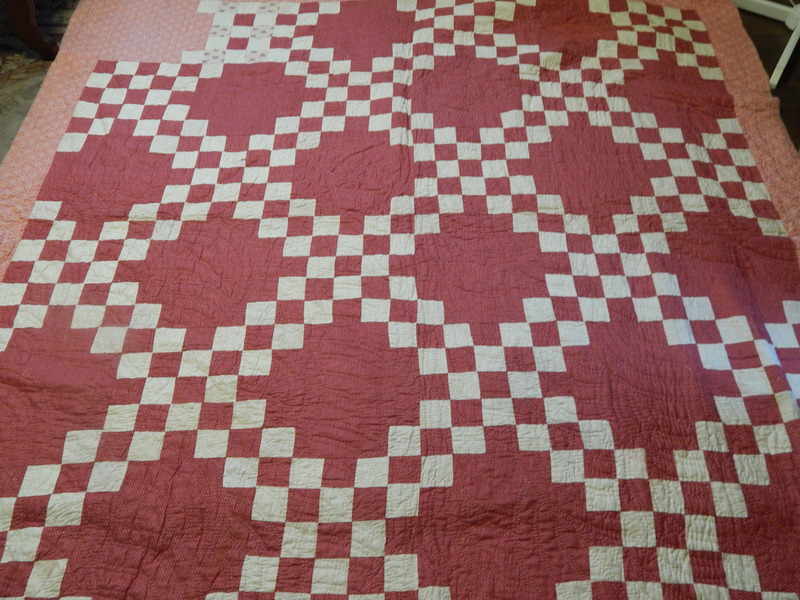 I also got another quilt. This is not a candidate for washing. The brown fabric is shattering. The dye used is the culprit. 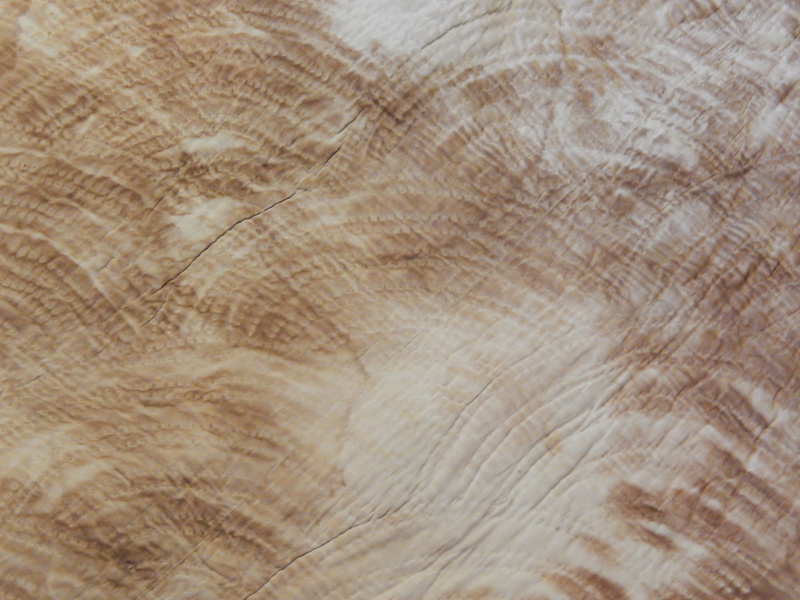 Many brown fabrics from the era disintegrate because of the dye process. 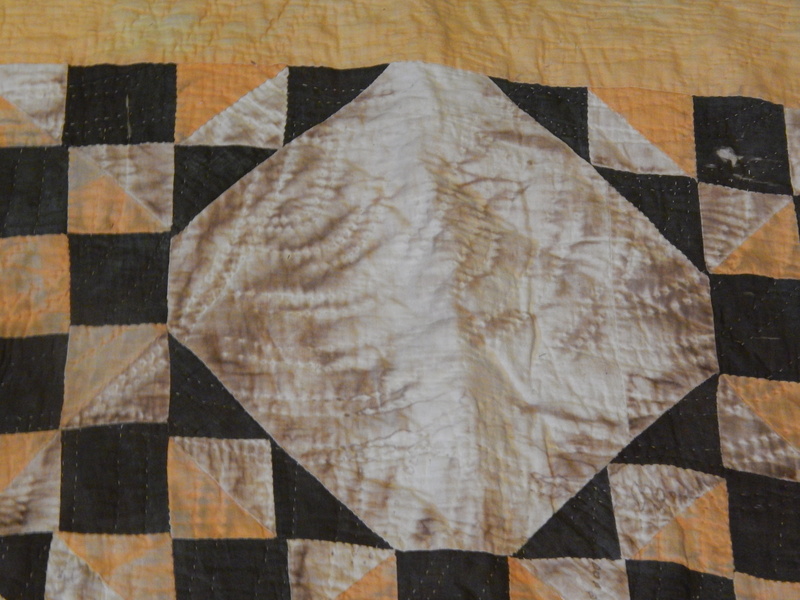 Shattering brown and all that dirt means that this wont ever be a usable quilt but I think I might wash it so I can show what can happen when you wash a quilt that shouldn’t be washed. But this one was a perfect candidate. 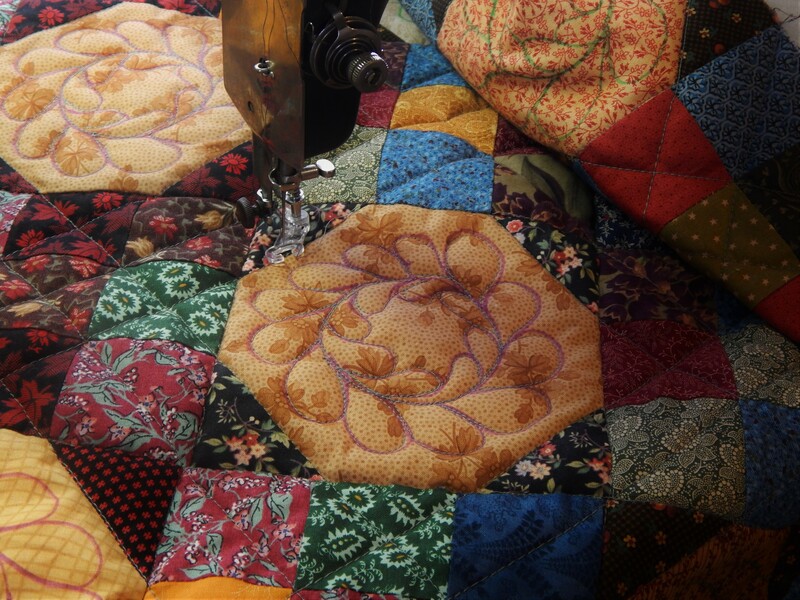 This entry was posted in Quilts and tagged antique Quilts, painting, Quilting, Quilts. Always a smile when Teddy makes an appearance. I would like to know what you ate, I could use some energy to get some things done around here! Love the way your valance is looking in the window. Love the wall colors, what a difference it makes. Nice antique quilt and I see Teddy approves, too. 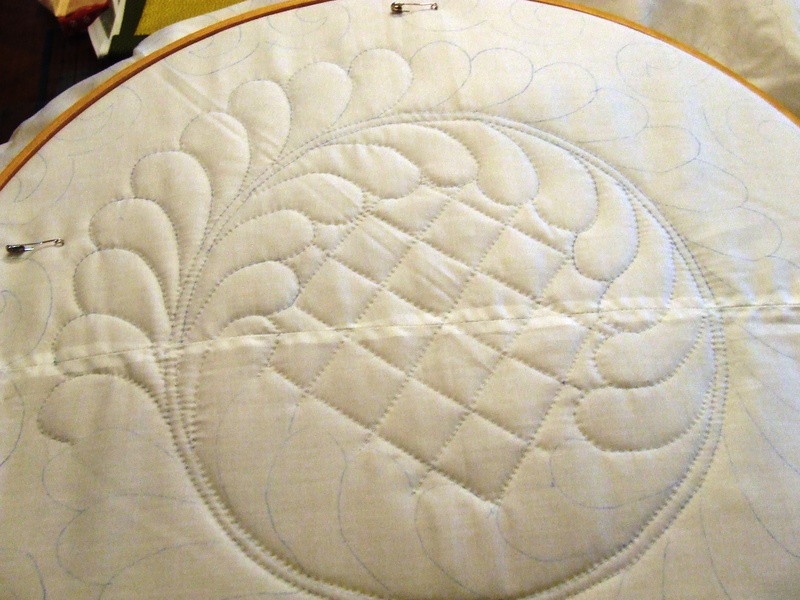 Love the quilt – valance idea. — I might just tweek that idea for my own purposes. — Yes, if you do not like the wall color you might as well change it. Some colors will never grow on you. 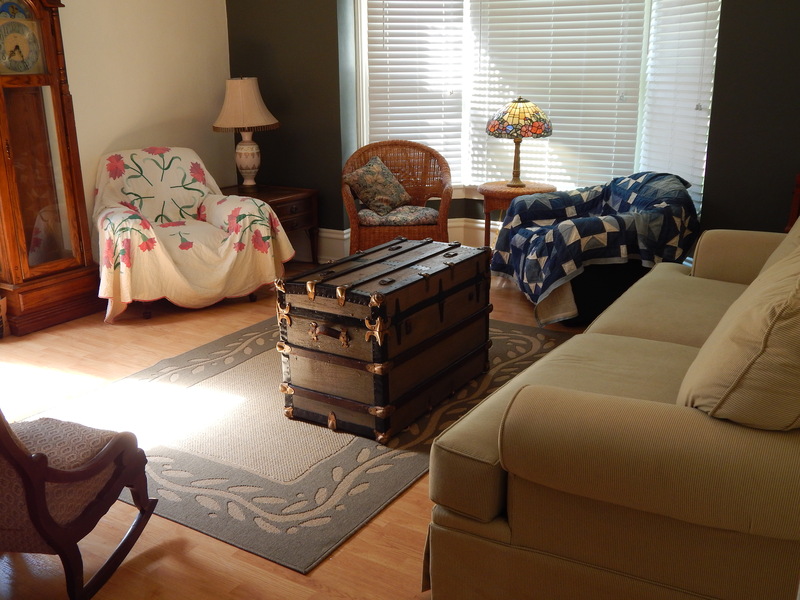 Love your window treatment and also your new “quilt treasure”, Tim! Well done all around; really like the valence treatment, very effective, just the right balance. 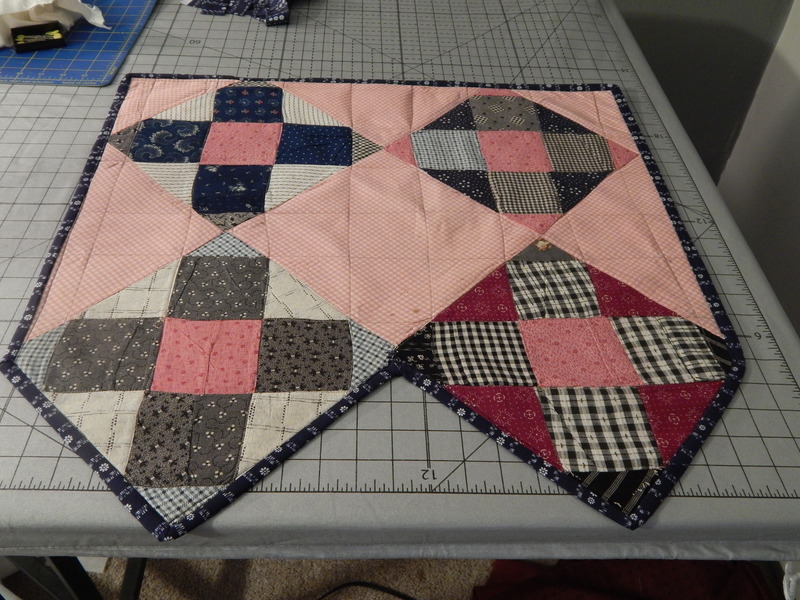 I really like the new wall colors….and love the quilt valance!! 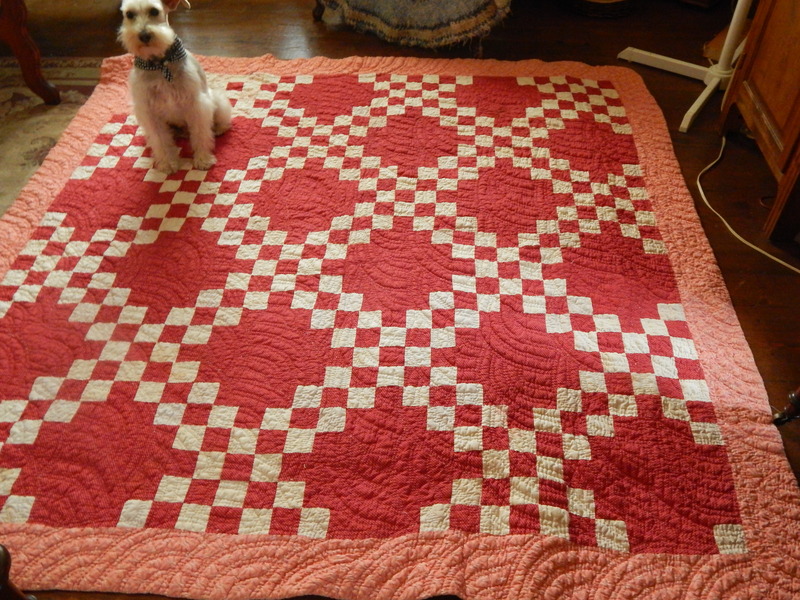 That red and white quilt is awesome….I see Teddy is at work inspecting and approving!! I had to laugh when I read the “one thing leads to another”…. We had an experience a number of years ago when my husband’s grandmother passed away, and we got a beautiful antique rug….well, that “free” rug ended up costing a pretty penny because our master bedroom walls didn’t go with the rug, and neither did the window treatments….that led to redoing the adjoining bathroom…removing wallpaper, painting the walls, and installation of a new pedestal sink!! But we were so happy with the results, and I think you will be as well!! 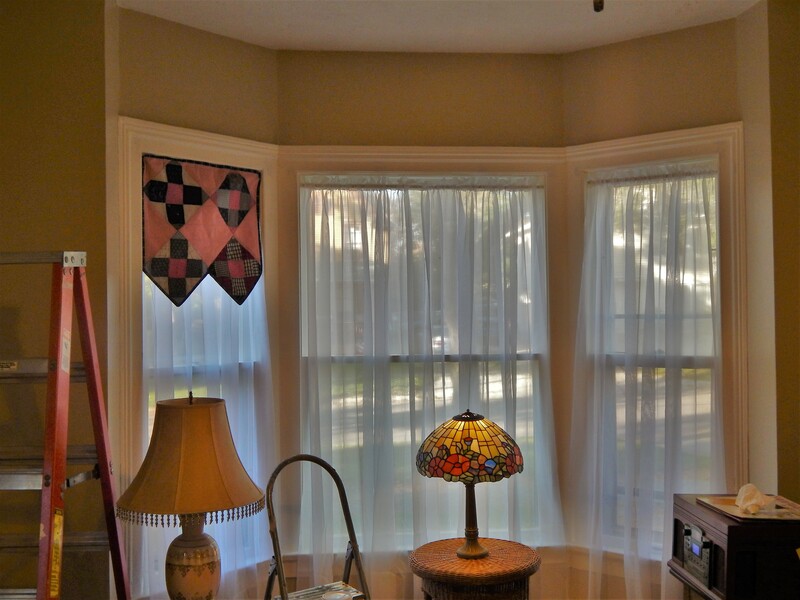 Love the window treatments! Now you’re painting…….one man with an attractive supervisor gets so much work done! Nice work Tim. Hi to Teddy with ear scratch from me. Well, it looks like your back is allowing you some movement up and down the ladder, so that is a very good thing. 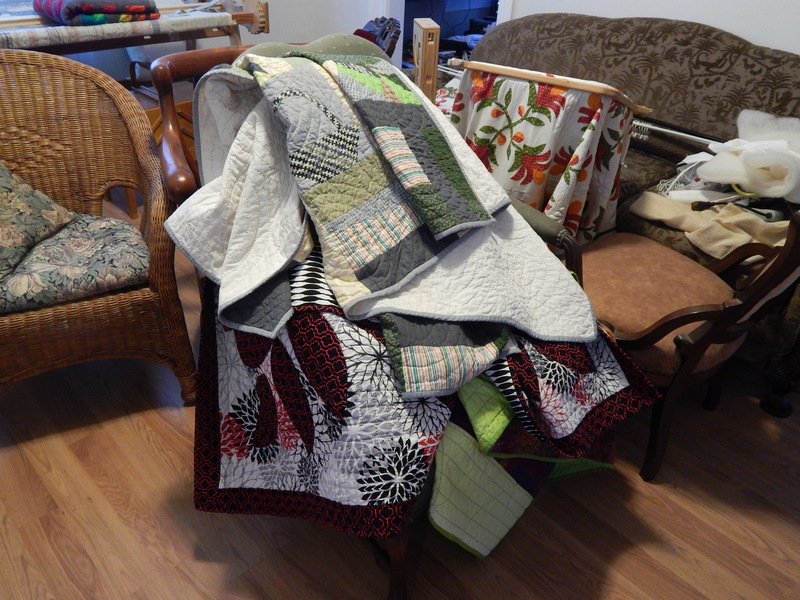 Thanks…..that other quilt does look really bad….hard to imagine where all the stains came form …..mush have gotten wet and then dried all folded ? 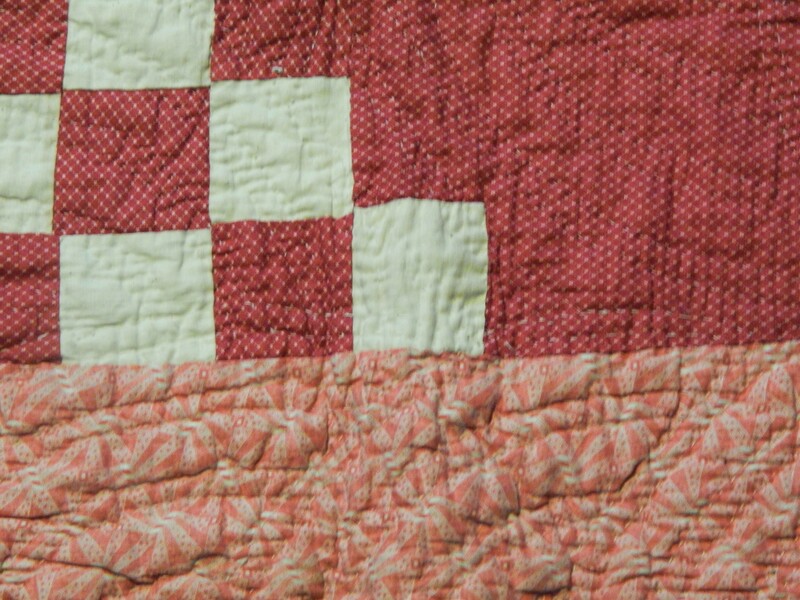 The quilt that you washed is beautiful. 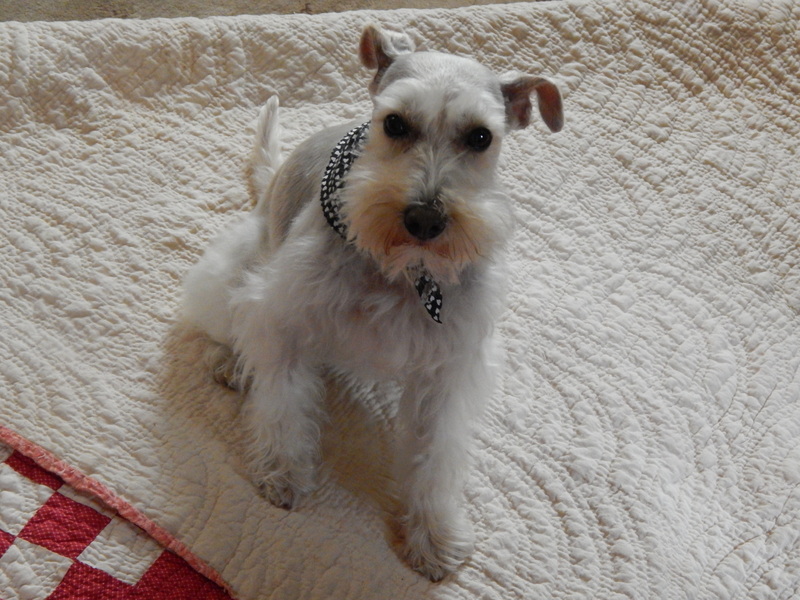 The quilting is so nice and Teddy looks just right posing on it. You are doing a great job painting. It really opened up the room. It will be a very pleasant area once you are finished. 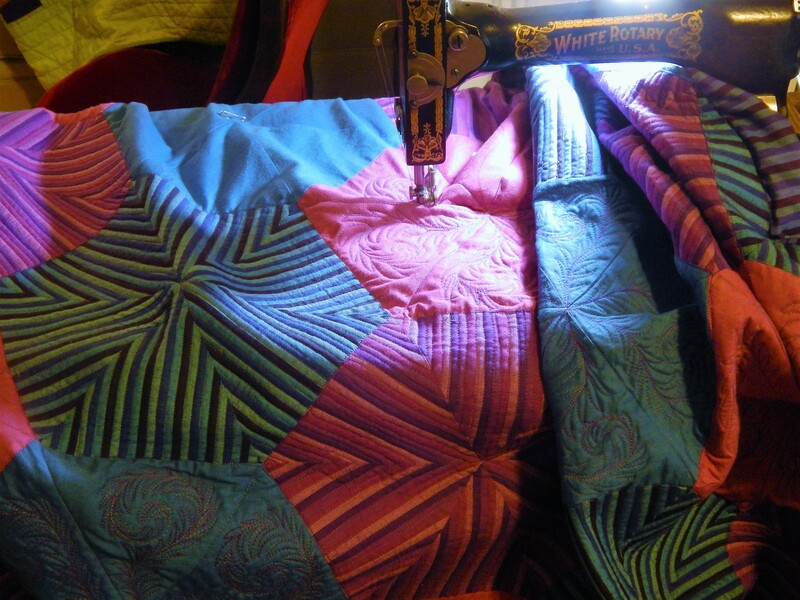 Roofing, painting, making curtains, quilting, decorating…… Is there anything you can’t do!!!! You must be exhausted, but it’s all so beautiful, Tim. You inspire us.